Epicurus, a philosopher in Ancient Greece, believed that in order to live a fulfilling and happy life we should seek tranquility, avoid pain and overindulgence, be self-sufficient and enjoy the companionship of good friends. Not a bad group of tenets to live by really. Epicurus also believed that the physical world was composed of atoms that continuously collided with each other randomly. Quite insightful, considering this was over a thousand years before the theory of particle physics had been developed. I think he really had some great ideas and I try to implement them into my daily life as much as possible. It is a huge cliché, but the best things in life really are free. Sometimes I cannot believe that we are composed of so much space and that the spaces between the atoms are greater than the solid bits. Things have been really on an upswing around here recently. I have completed the first of two paintings of Jade, which I will attach tomorrow when I have a decent picture of the work. I have been in contact with some great collectors and supporters of my work, some fantastic folks who I am very fortunate to have met. All of these interactions feed the soul and provide a great sense of community. There are some great projects coming up that are just under the surface. I will share them as they develop. My friend, who is also in a creative field, and I were talking the other day about how fundamentally our vocations and what we produce are superfluous...no one really NEEDS artwork. It is a scary thought that when anarchy hits, be it in the form of a pathogen, economic collapse or any other number of scenarios, we'll be the first to go:) Oh well, at least I can draw pictures of people on the sidewalks, running by in the midst of chaos to chronicle the madness. However, until that time comes, if ever, we shall endeavor to continue producing work that is special to us, in whatever form that may be. 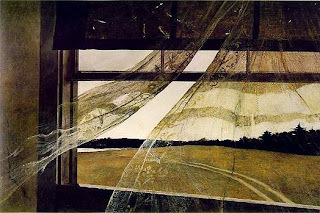 I was speaking with my friend John today and we were talking about Andrew Wyeth, that modern day master of art. This man is a genius. There are two books by my easel constantly. One is a book of paintings by Lucian Freud. The other is a book by Andrew Wyeth. His watercolours and tempera paintings are something almost otherworldly. I have attached a link to his official site at the top. Please have a look. You won't regret it. I love Wyeth's treatment of light and shadow...amazing compositions and a fantastic melancholy and sense of absence in his paintings that I really identify with. Today's Pet Peeve: Modern day strollers. They are behemoths! When I was a child I had a tiny, collapsible stroller. If you folded it up you could swing it and hit a golf ball...it was compact, small and practical. Today these strollers are so large that in a pinch you could toss a tarp over one and camp safely underneath. I'm surprised you don't see a line-up of the things down at the DMV getting license plates. Watching: Starting Out In The Evening. Fantastic film with a stellar performance by Frank Langhella. Rent it. If you love literature, fine writing and effortless acting, you should see this film. The arts won't make you virtuous and they won't make you smart, but they are nevertheless my faith, firmly installed in the part of me where some people put religion. Great art, alas, has sometimes been loved by monsters, famously the Nazis. George Steiner, the eminent critic, delivers the bad news: "We know that a man can play Bach and Schubert and go to his day's work at Auschwitz in the morning." But cultured death-camp guards didn't destroy German culture. True, they eliminated any foolish belief that great art comes with ethics attached. But when the Holocaust ended, German culture remained. On a more trivial level, we also can't claim that immersion in the arts will create a lively mind. Art education has produced armies of learned bores. I knew a man who had Shakespeare, Verdi, Beethoven and the rest of the gang played at him by the greatest performers of his time, night after night for a lifetime. Did no good. He remained gloomy, narrow and hopelessly addicted to conventional wisdom. He was like the oaf in Love's Labour's Lost who has "never fed of the dainties that are bred in a book, so his intellect is not replenished...."
As for those who create art, we get it all wrong if we imagine their work makes them admirable in private life. Rebecca West, a great journalist of the last century, remarked (rather like Antonio Salieri discussing Mozart in Amadeus) that "the power to create a work of art, like a good complexion, is frequently bestowed on the undeserving." So my faith, rather like Christianity, comes with no guarantees of virtue or enhanced intelligence. love are offered the chance to live more expansive, more enjoyable and deeper lives. They can learn to care intimately about music, painting and books that have lasted for centuries or millennia. They can reach around the globe for the music, the images and the stories they want to make their own. At its best, art dissolves time; only through art can we catch a glimpse of what life was like in ancient Greece or medieval Spain or pre-modern Japan. The human mind (according to William James, in Principles of Psychology) is "a theatre of simultaneous possibilities." The arts build the sets for that interior theatre and fill the stage with vivid, memorable characters who mingle in memory with the people of our lives. Even if we are otherwise lonely, we go through life in the company of this ever-expanding society of artists, characters and images, each of them chosen by us. Experiencing Shakespeare over the years I have come to two conclusions. He was the greatest human who ever lived (no one else has equaled his imagination or given the world more), and he wanted me to understand his characters. There are times when Hamlet seems my brilliant contemporary and my complicated, difficult friend. When I stand before a Velazquez, I feel exalted and privileged -- but I also feel close to the artist and his subjects. On most days, I find myself thinking of something written by W.H. Auden, my favourite modern poet, one of the most intelligent people of recent times. When I read him, I can sometimes hear Duke Ellington, my idol among modern musicians, playing in the background. The arts also let us live, imaginatively, within the world where they are produced. They give us an alternative human narrative -- and perhaps that's their most generous gift to us. History as seen through the arts doesn't portray demagogues and soldiers as the greatest figures. It's a history where delicate, fascinating traditions are handed down the generations, developed, subverted, forgotten and rediscovered, all within a drama that makes reality created by politicians seem pale and predictable. Art gives us, as well, the opportunity to look at everything around us in a slightly different light. It changes our perspective. As Schopenhauer says, "The artist lets us peer into the world through his eyes." The eyes of the best artists see wonderful surprises. The other day, Jeffrey Simpson in The Globe and Mail said the president of France, Nicolas Sarkozy, "will ultimately be judged on whether he can steer his country toward a better economic performance." France? The country that has given world culture so much, judged on its economic performance? Of course Simpson's right. That's a fact of life. But this is one of those times when a fact of life is both unsettling and appalling.